The Indian Navy (IN) is at the cusp of finally inducting its first domestically designed and build nuclear powered ballistic missile submarine (SSBN) – the INS Arihant. Powered by an 83 MW pressurized light-weight nuclear reactor, the Arihant-class SSBN will form the nucleus of India’s sea-based deterrence. In turn, it will provide India with assured second-strike capability – which could occur through the Arihant’s capacity to launch nuclear-tipped cruise and ballistic missiles (such as the 3500km range DRDO K-4). Four additional Arihant-class SSBNs will join the Indian Navy in the coming years. Granted, it will still be some time before the Indian Navy fully harmonizes its personnel, infrastructure, doctrine and planning with its emerging SSBN fleet, but it is clear that it is merely a matter of “when” and not “if.” In comparison to the Indian Army and the Indian Air Force, the Indian Navy has traditionally made and in fact continues to make very impressive strides in all areas of its development – surface combatants, aircraft, power-projection assets, and submarines (nuclear and conventional alike). All things considered, the most concerning threat to China and even Pakistan to an extent would be the Indian Navy. For China, the Indian Navy’s progress in building a capable blue water fleet and New Delhi’s ties with the U.S. anchor it as a real player in the Pacific Ocean (in opposition to China). For Pakistan, the Indian Navy readily has the means to fully interdict Pakistan’s sea-lines-of-communications (SLOC) – i.e. its maritime trade routes (which connect to leading trading partners, such as Gulf). In turn, this enables the Indian Navy to directly threaten Pakistan’s coastal economy. Karachi constitutes a fifth of Pakistan’s total economic output, while Gwadar is a critical component of China’s massive economic investment plans (i.e. the China Pakistan Economic Corridor or CPEC). 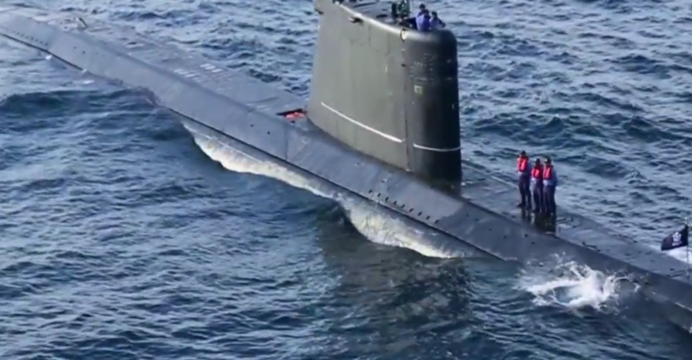 While the urgently critical need to modernize and strengthen the Pakistan Navy has been discussed on Quwa before, the issue of India’s SSBN fleet is a somewhat different matter. Yes, the primary respondent to any nearby SSBNs will be the Pakistan Navy, which will require continued development of its anti-submarine warfare (ASW) capabilities (in the form of new ASW frigates and aircraft). However, India’s SSBNs also fall under the question of strategic parity, which has been a central pillar of Pakistan’s defence strategy since the 1970s when it formally initiated its nuclear weapons program. To answer this question, it is important that we have a workable understanding of what SSNs and SSBNs actually are and why they are acquired. At this point, one might understand that nuclear submarines are powered by nuclear reactors. Not only do these nuclear reactors provide an immense amount of energy (thus enabling submarines to travel relatively fast when submerged), but they can function for basically the life of the reactor without refuelling. This is a huge strategic advantage as SSNs and SSBNs out at sea do not need substantial support from their fleets, besides perhaps fresh supplies for the submariners, such as food, for example. These submarines could go farther and faster, stay at sea and undersea longer, and – especially in the case of SSBN – carry more in terms of weapons. It is for these reasons that SSNs and SSBNs are in fact the mainstay submarines of blue water navies, i.e. naval forces that have to traverse the Atlantic and/or Pacific Oceans in order to maintain their countries’ geo-strategic interests. The U.S., Britain, France and Russia (more so during the Soviet Union) are the world’s prime SSN and SSBN users, with China and India entering the mix in recent years. At heart, SSNs and SSBNs are not defensive systems designed for area denial or even regional warfare, they are meant for fleet-on-fleet battles in the open seas and for inducing pressure on distant enemies. China has sought SSNs and SSBNs as a means to induce pressure on the U.S. naval presence in the Pacific, and India has viewed China’s advancements as threats to its geo-strategic security. In fact, one could argue that it would be disadvantageous to use SSN and SSBN within a focused – and in Pakistan and India’s case, territorially adjoined – conflict scenario. The naval theatre on Pakistan’s end is not as vast as the Pacific Ocean, so the room its own SSN or SSBN would have is going to be much smaller. Knowing that neither India nor Pakistan are going to muster exceptionally quiet SSNs and SSBNs, it would be reasonable to conclude that these highly valued gems would be particularly vulnerable against each side’s ASW assets. India has an impressive ASW force, but Pakistan’s ASW capabilities are not to be scoffed at either. Can one seriously suggest that SSNs and SSBNs will be of immense added benefit over air-independent propulsion (AIP)-equipped submarines along the Arabian Sea and western Indian Ocean? From the context of submarine warfare, SSNs and SSBNs are not a significant issue for either side. The real problem actually comes from the deterrence value of these submarines. Pakistan’s ballistic missile arsenal is very explicitly pointed at India. Even its longest range ballistic missile – the Shaheen III – is designed to keep the entirety of India within the range of Pakistan’s nuclear strike capabilities. But this capability is land-based, Pakistan’s strategic capabilities in the air and sea (today and in the future) are much shorter in range. This is because the nuclear strike capability of the Pakistan Air Force and the Pakistan Navy are centered on cruise missiles: The Ra’ad is at 350km and the Babur is at 700km. In effect, Pakistan could view its second-strike capability as incomplete, and thus, not assured. If its AIP submarines or fighter aircraft cannot hit India’s most eastward targets like the Shaheen III, then it means India’s strategic capabilities (especially with its SSBN in the picture) are basically unthreatened. Whether this is how Pakistan is looking at the situation or not is another story, this is simply a point-of-view. Hence, while there is no inherent naval warfare need for an SSBN, Pakistan could have an overarching strategic need for an SSBN. Of course, the availability of longer range air and sub-surface launched munitions would rectify the range issue. Hence, this is not a simple topic with one clear answer. We will take a deep (no pun intended) look at this question in part-two.